We have many years of experience in servicing homeowners in selecting and handling materials you need to get your job done right. We take the time to pick your order and utilize our delivery vehicles so you don’t have to take time away from your busy day. No one likes to wait long for something he or she has ordered. That’s why Iverson’s has raised delivery service to a fine art. 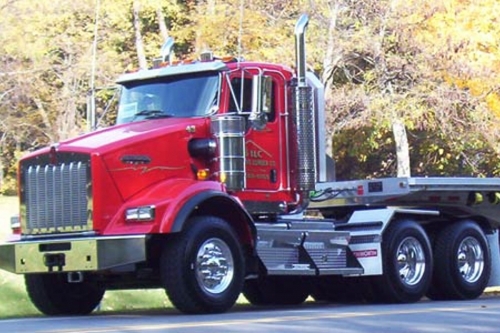 We are proud of our delivery fleet of trucks including: flatbeds/vans, tractor trailers, boom trucks, truck mountable forklifts and trucks specially designed for window and door transport. Advantage #1 - We Save You Time and Money! Iverson’s Lumber has many years of experience in servicing contractors, home builders and homeowners in selecting and handling materials you need to get your job done right. We take the time to pick your order and utilize our delivery vehicles so you don’t have to take time away from your busy day. At Iverson’s Lumber, our drivers undergo rigorous training on the safe and proper operations of their vehicles. They are trained to identify delivery site conditions that may pose a potential safety risk to themselves, their delivery vehicle, our customer and customer’s property. Our drivers will opt not to use your driveway or lawn if they know damage will result. See FAQs page to find answers to your questions.